These high quality brass plaques are perfect for both indoor and outdoor use. Whether you’re looking for a commemorative plaque in memory of a loved one or want a number of brass plaques for your offices, Alpha Gifts & Awards is your one stop shop. 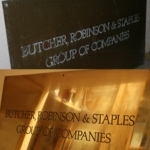 Our experienced engravers use the latest equipment to ensure all engraved brass plaques meet your high standards. 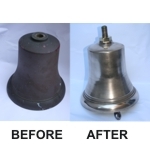 We can engrave text, logos and images, while various fonts are available to suit your requirements. 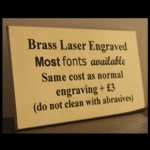 Let Alpha Gifts & Awards create a bespoke brass plaque with a customised message to suit your needs. 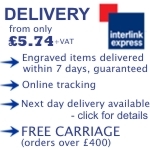 Take a look at our selection of brass plaques below and click ‘add engraving’ when you’ve made your choice. If you would like more information please contact us on 01823 288582. Engraved Brass House Plaque - Small 6" x 4"
Brass Plaque - BENCH 6" x 2"
Brass Plaque to engrave - Large 8" x 6"